Ballyliffin clubhouse presides over an inviting 36 holes and a few sheep. 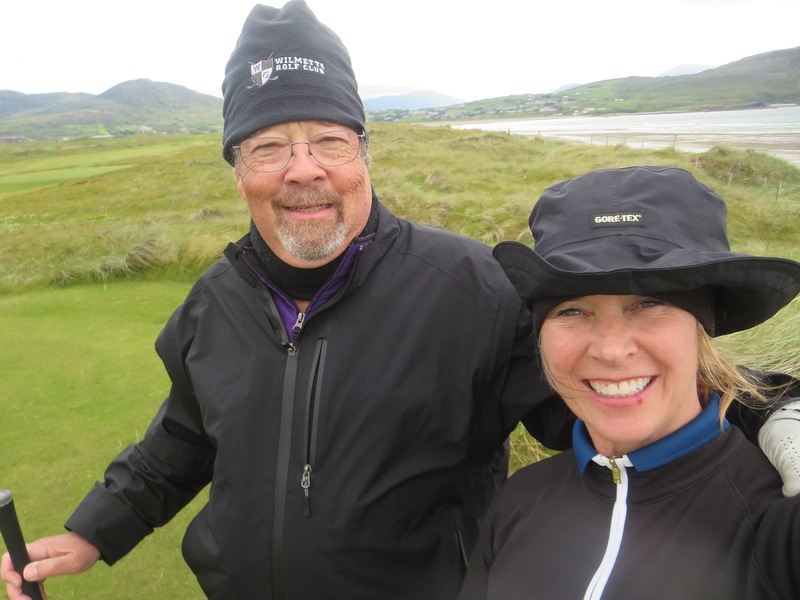 As we headed off to Ballyliffin, our journey was about to change in many ways. 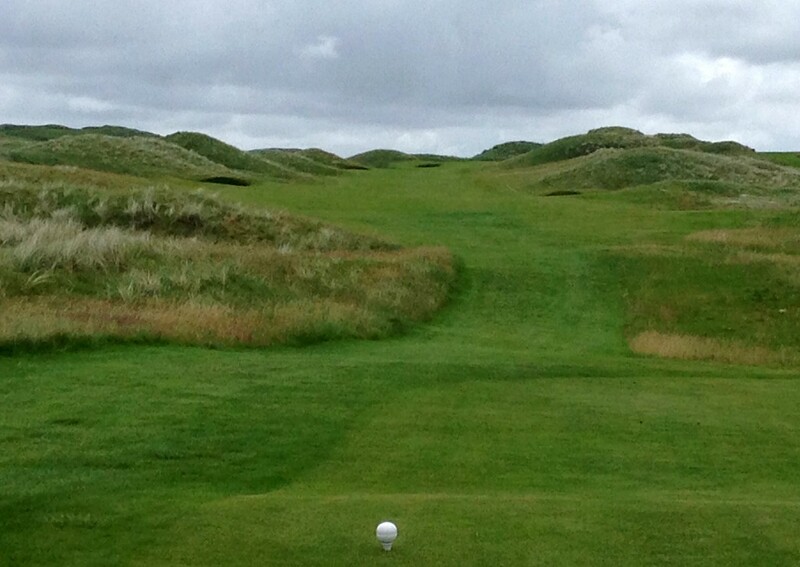 Not only had Royal Portrush concluded the Northern Ireland phase of our visit. The weather, which had been so cooperative during our first week in Ireland, was about to become far less predictable, with rain elbowing out the largely sunny periods we had enjoyed. 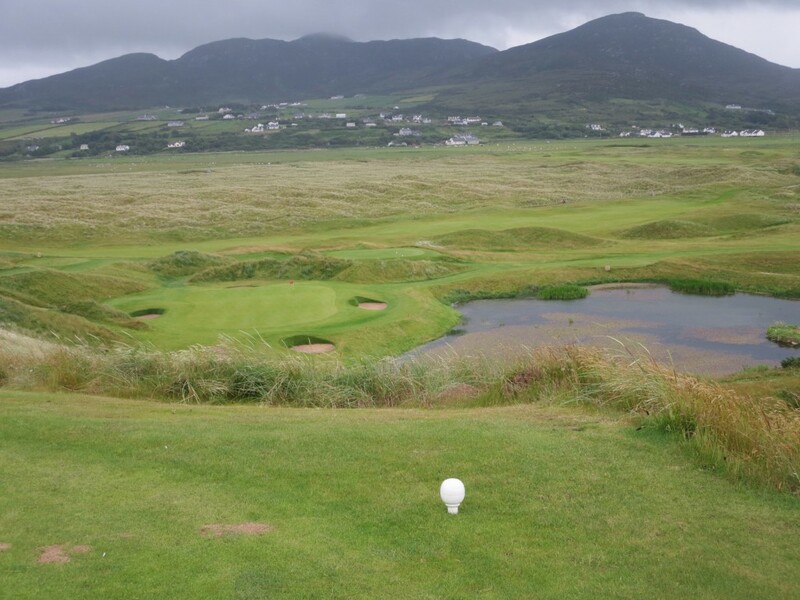 In addition, we were heading off the beaten path—from popular top-100 must-plays such as Royal County Down and Royal Portrush—to some enticing but remote links in County Donegal, on the northwestern edge of the Republic of Ireland. 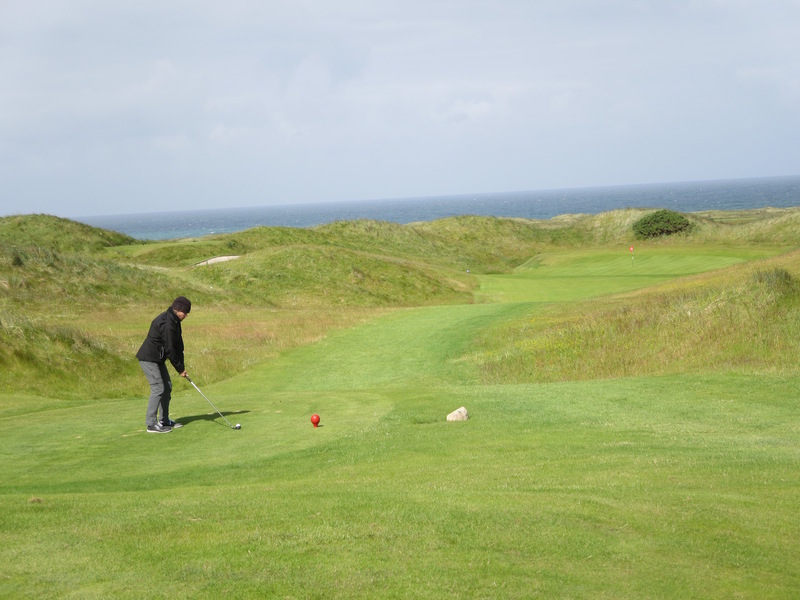 Ballyliffin is the northern-most golf course in Ireland, not far from Malin Head, the northern tip of the island. It’s all about the golf up here. And the golf is all about the wind. The 60-mile drive, southwest to Derry and then back up the Inishowen Peninsula to Ballyliffin, took about 90 minutes. As we approached, we could see the large, modern clubhouse, an attractive building with a comfortable pub/restaurant upstairs that offers gorgous views of the stately links and surrounding countryside. Ballyliffin has two courses. Its “Old Course’’ opened in 1973 on linksland where golf had been played for decades before that. Nick Faldo supervised a 2004 bunker renovation. In 1995, the club added its Glashedy Course, named after the Glashedy Rock that is Ballyliffin’s version of the Ailsa Craig that sits offshore from Turnberry. It was designed by Pat Ruddy and Tom Craddock. No. 7 on Ballyliffin’s Glashedy Links is a tricky downhill par-3. That’s certainly the case at Ballyliffin. 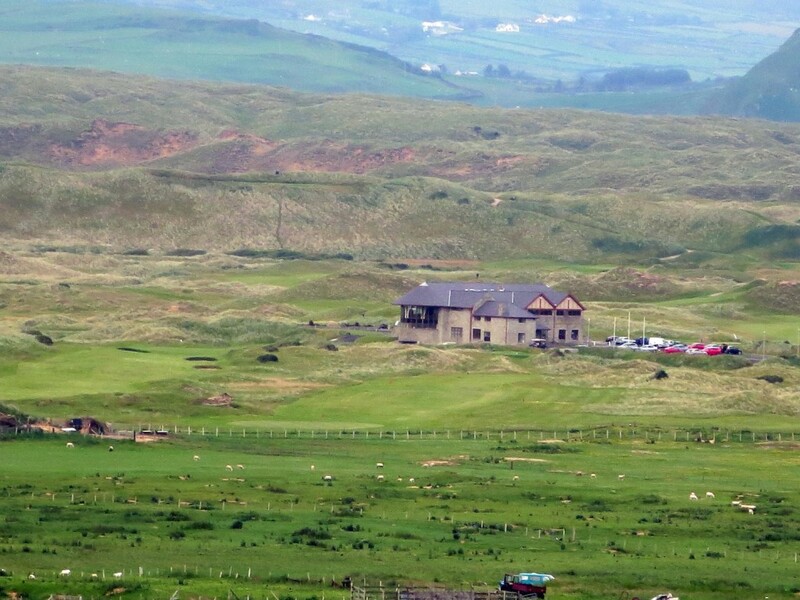 Barely a mile from the clubhouse is the town of Ballyliffin, which has several comfortable hotels as well as B&Bs. With so many things to see in the north of Ireland, we budgeted two nights in Ballyliffin. A longer stay, however, would make for an enjoyable and relaxing golf holiday. The Ballyliffin Lodge, where we stayed, had an excellent dining room, pool and spa, and attractive packages. The golf did not disappoint. Both courses are excellent links that complement one another. The Old Links, which we played first, is a fun, old-school layout with bumpy fairways and smallish greens, and with pot bunkers and fescue-laden dunes to be avoided. The Glashedy Links is a bigger golf experience. Its fairways are wider and smoother, its large greens are an accessible concession to the ever-present wind. Both were fun and challenging. “Both golf courses are a step back in time,’’ general manager John Farren said. 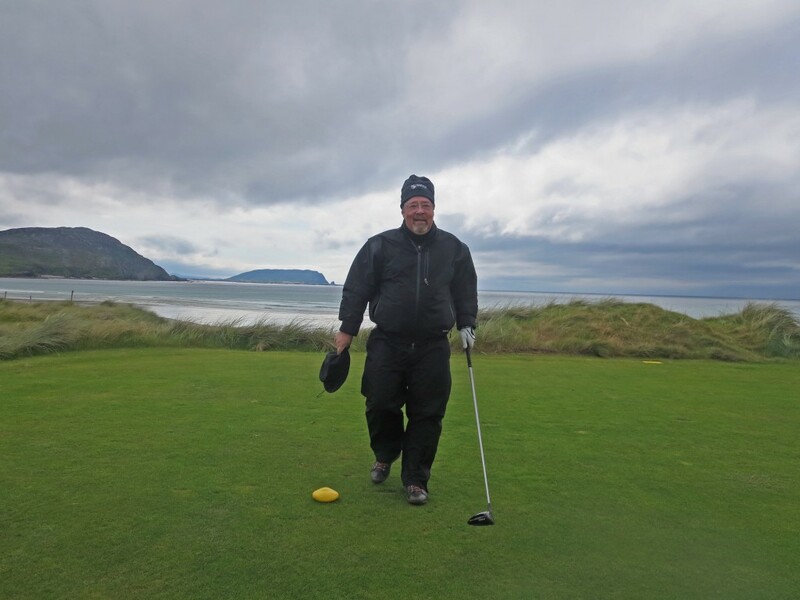 No matter how promising the weather when you tee off, it’s always good. . .
. . . to have raingear handy in Ireland. When the rain started coming down toward the end of our front nine on the Old Links, we opted to wait out the storm in the pub before resuming. One of the many appeals of a remote links like Ballyliffin is that you can take it at your own pace. Fortified by a pint and some excellent seafood chowder, we resumed our game. Another appeal of Ballyliffin is its solitude. 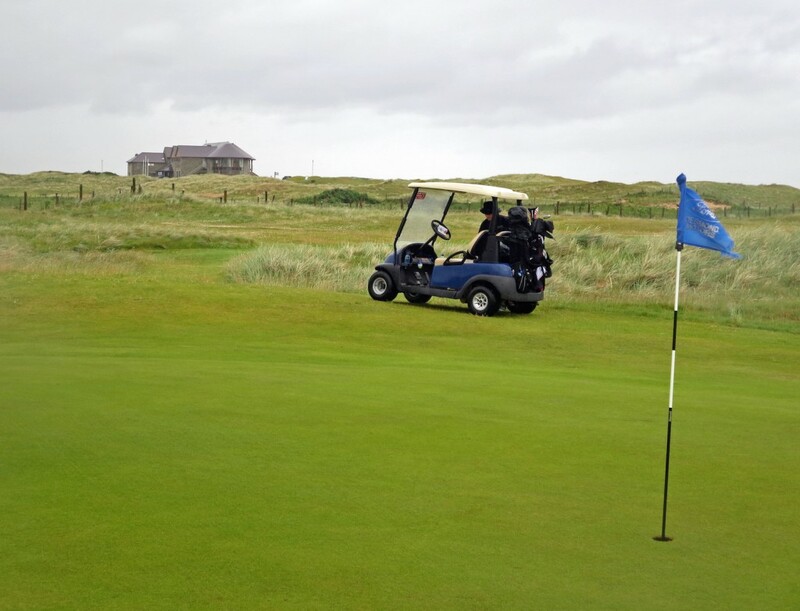 The 36 holes of the two courses rise a bit to high dunes at a point farthest from the clubhouse, but Ballyliffin’s layout rises gently in most places, providing excellent sightlines of the course, Pollan Bay, Glashedy Rock, the village of Ballyliffin, grazing sheep and the hills beyond. In other words, it’s a peaceful, scenic golfing experience. A couple of purists I know had been more taken with the Old Links, but Liz and I also were impressed with the Glashedy Links. Although it’s a bigger golf course, it’s a fun challenge for players of all skill levels. There are few, if any, places on either course where the demands are overwhelming at Ballyliffin—and yet, both courses are demanding. The dilemma of golf in Scotland and Ireland is that we Americans tend to want to experience as many of their wonderful links as we can, especially on the most publicized, highly ranked courses. I was thinking about this when we encountered a group of 16 New Zealanders who were touring around Ireland together. Their bus driver described an itinerary that hit virtually all the biggest names in Irish golf, both north and south. Recalling how Liz and I had had difficulty picking and choosing a mere northern route, I was impressed and boggled. One of these times, we’re hoping to narrow the field, choose a spot or two to really settle in, and relax and enjoy. Which is a long way of saying, Ballyliffin would be a very peaceful place to spend more time. And the golf there would not get old.